Dental hygiene is important to your dog's overall well-being. Dogs can have health complications because of a lack of oral hygiene and periodontal disease. There are several preventive and remedial treatments for your dog that will keep her healthy and smiling pretty. Perhaps the best way to prevent dental problems in your dog is to brush her teeth. Daily brushing is the most effective, but even brushing every other day will help reduce the build up of tartar. Tartar, which is the buildup of calculus on the teeth, is the leading cause of dental problems in dogs. Tartar cannot be removed by brushing, so preventing its formation is best. The earlier you begin training your dog to accept a canine teeth cleaning, the easier it will be in the long run. Puppies usually adjust easily to the treatment. However, older dogs can also be taught to tolerate a tooth brushing. Begin the training by having the correct tools. You'll need a veterinary toothpaste and a toothbrush designed for dogs. Don't use the human equivalents. Human toothpaste has additives, such a baking soda, that may upset your dog's stomach. A human toothbrush is also not designed for the canine mouth. Letting your dog taste a little of the canine toothpaste on your finger. It is specially formulated to taste good to dogs, so your pet should enjoy this new "treat." Praise her as she licks it; this will encourage the association of praise with the toothpaste taste. Next, place some toothpaste on a finger and place it in your dog's mouth. Don't start brushing the teeth yet; merely let your dog become accustomed to the feel of your finger in her mouth. This may be enough training for the first session. Next, you will want to gently run your finger with toothpaste along the gum line. Don't try to touch the entire mouth in the the first session. Keep each step short, no more than 30 seconds to a minute. Positive reinforcement and praise are key to establishing a trust between you and your dog. Repeat this stage several times over several days. After a few days of this training, wrap your finger with some sterile gauze, Coat the gauze with the toothpaste. Rub the teeth gently. You are teaching the dog to accept a foreign object in her mouth. Continue this process for several days. Begin to rub the teeth in circles at the gum line, similar to the brushing action of human teeth brushing. Your final stage will be to introduce the canine toothbrush. Take this step in slow stages. Begin with the gauze finger and switch in the middle of the session to the toothbrush with toothpaste. Don't press hard or do too many teeth during these preliminary sessions. Slow, easy steps will be more successful that fast ones. When your dog has adapted to the toothbrush, you can begin to use the gauze less and the toothbrush more. Eventually, you will reach the point where you are brushing your dog's teeth with only the toothbrush. There are special foods and treats formulated for a dog's dental health. They encourage a dog to gnaw and work the teeth thoroughly to prevent tartar buildup. However, you should not believe every package that claims it is good for your dog's teeth. Check instead with your vet for chews and food that are proven to help keep your dogs teeth healthy. Most dogs will need a vet cleaning at some time in their life. Some dogs will need them yearly. Your vet will recommend how often based on a physical exam. 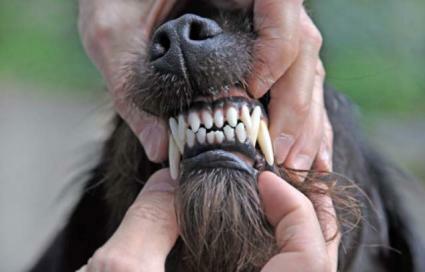 If it has been a long time between teeth cleanings, your dog may also have some teeth extracted. Your vet will give you a record of what occurred during the procedure and which teeth were extracted. Your dog will benefit greatly by receiving regular dental hygiene care. You can prevent many dental problems by brushing her teeth regularly.